Airbus is joining the race to take driving to the sky. Except their cars will be entirely automated and ordered on demand. It’s interesting to see various major companies zero in on similar ideas. We previously talked about Arconic’s Jetsons plan, which listed the prediction that things would keep heading skyward; larger and larger skyscrapers with the job of not only hosting space, but cleaning our air. Apparently, Airbus, appendage of the multinational aerospace and defense behemoth from Holland, has a similar outlook. However, in anticipation of taller and taller buildings, they are looking at newer forms of transport and Airbus wouldn’t be Airbus if they didn’t first consider something that could fly. That flying something is a flying car. 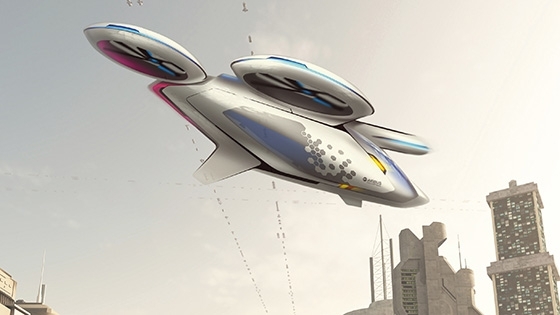 The big initiative from Airbus is Urban Air Mobility, a self-driving flying car for ride-sharing. Essentially, a much more terrifying Uber ride for people who hate stoplights. We’ve certainly heard about plans for flying cars, but here’s the kicker with this one: CEO of Airbus, Tom Enders, is looking to have a full and proper prototype by the year’s end. This announcement left a lot of journalists skeptical considering that the long history of flying cars has been an unsuccessful one with limited entries occasionally making little more than slow news. Here’s another kicker: the prototype is planned to accommodate a single rider. Airbus is already looking to partner with Uber for on-demand helicopter rides. And all of this is only one part of a much larger project they are working on with their division known as A^3. A^3 is the “Silicon Valley outpost of the Airbus Group,” as their website puts it. They’re essentially the division of Airbus Group that is overseeing and designing these new developments such as Project Vahana, the project name for Urban Air Mobility. They’re currently devoted to developing fully autonomous flight for one or more passengers as an on-demand service for major cities. The goal is to provide an alternate means of transport to combat the time lost in densely populated cities due to traffic gridlock and other grounded impediments we all know all too well. They believe that full implementation within ten years is a reasonable goal; “Many of the technologies needed, such as batteries, motors and avionics are most of the way there,” according to Rodin Lyasoff CEO of A^3. No major city in the world, however, allows drones to traverse their city without a remote pilot, leaving A^3 in a proof of concept phase. 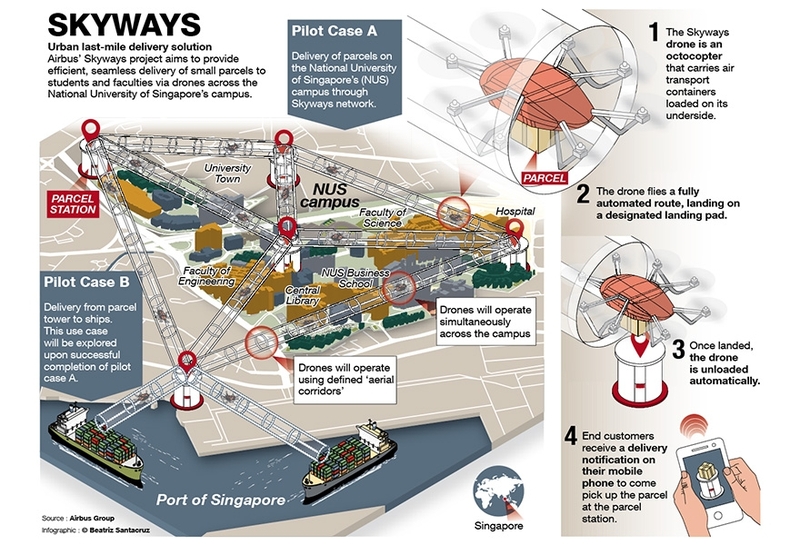 They’re proceeding through this phase with the National University of Singapore, who is allowing them to develop a parcel delivery service that they eventually intend to market to Amazon rather than compete with the retailer’s drone services. A^3 and Airbus as a whole believe that this is the logical next step for public transport and that they face incoming competition from the likes of Elon Musk and e-volo. Hence their rush to have a working prototype. Airbus certainly has the financial capacity and corporate history to allow for this sort of development. However, if they want to progress at the speed they’ve outlined, they may need to acquire smaller startup businesses who are already rapidly developing elements of the technology they need before their competition. Personally, I can’t wait for all the test failure footage on YouTube. That’s going to be one hell of a fun ride. In what sense are these “cars”? Eventually, cites are going to be going lax on their restrictions on none remote pilot drones flying around. It will be at that time when this company really gets down with the business. I give the company credit. There is a major push for this type of transportation in the big cities there is no doubt about that. I just do not see the end game being very easy to achieve. hmmm, it seems that Amazon may have opened a can of worms, as they say, with the delivery drones. The next 10 years or more could be very interesting. If we are scared some kid with a drone is going to take out an airplane near an airport, we really have something to worry about now. Great dream for the advancement of technology. We’ll keep an eye on this one as well to see how it pans out.